Accelerate growth while controlling the chaos that comes with size. 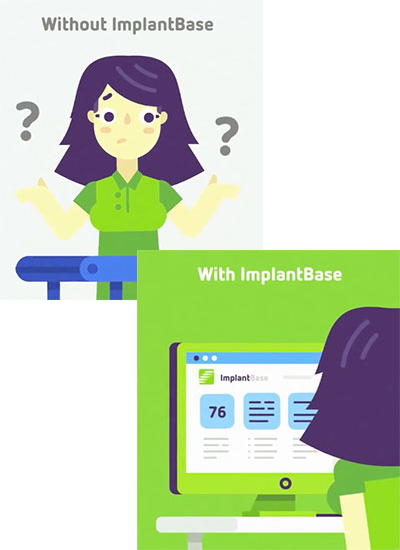 ImplantBase helps you optimize overhead structure by controlling headcount, maximizing efficiency through automation, and maintaining inventory visibility. As a result, you’ll reduce the significant complexity that can come with being a large-scale manufacturer. Growth often comes from mergers and acquisitions—and the integration of previously separate companies and products adds significant challenges. ImplantBase simplifies such integrations, freeing you to instead focus on differentiation through breadth of product offering and efficiency of operations. As the CFO of a large-scale manufacturer, you face significant pressure. Competition is fierce, and capital is ammunition in the contest for market share. When working capital allocated to consigned inventory rises, failure to liberate cash constrains the ability to advance leadership, board, and shareholder priorities. ImplantBase accelerates your ability to leverage capital while also giving you the tools to create a more agile, scalable, competitive organization. 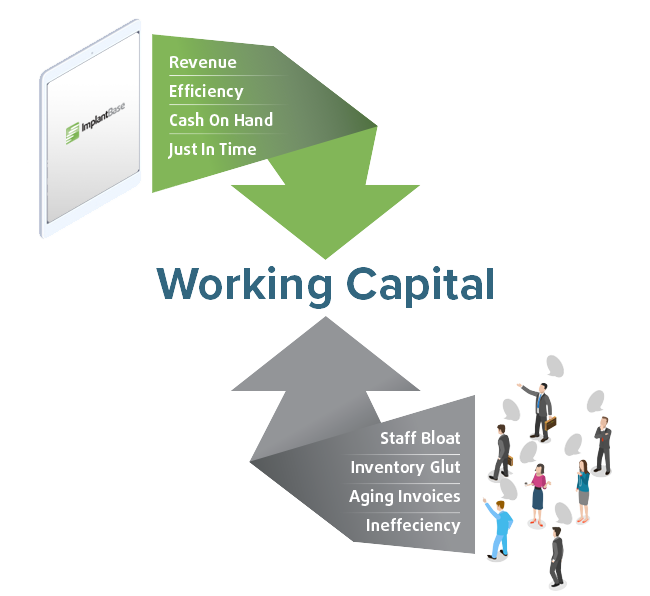 Utilize ImplantBase’s advanced reporting capabilities to quickly identify opportunities to liberate working capital. Realize the benefits of systemized sales and distributor operations to slow headcount growth while maximizing efficiency. ImplantBase helps you successfully transform operations into a competitive advantage. Every day, you deal with the complexity inherent in a sprawling sales and distribution network. Process and system evolution has created inefficient and ineffective ways of operating. Revenue is tied in up in cases awaiting PO#’s from hospitals. And, sales reps struggle with a range of tasks: accessing inventory, obtaining brand and product information, keeping pace with ever-changing commission structures, and providing data back to you. Unify this large-scale field sales force in pursuit of your goals. Empowering your field reps and streamlining their work lets them work more efficiently—and boosts their commitment to you. With best-in-class reporting and visibility, your sales leadership can more effectively drive success through an extended field sales network. With everyone working in the same system, there’s no question about whose data is correct. ImplantBase improves strategic decision-making and coordinates large-scale networks for optimum performance. Chaos continually bombards large-scale manufacturer operations. Employees saddled with mindless and redundant administrative tasks cannot contribute to innovation. Constant inquiries or slow responsiveness from the field needles distribution operations. Paper trails and digital threads proliferate. Digital transformation offers relief—and liberation. Configurable, adaptable processes based on best practices revolutionize operations. Freed from tedium, key employees can contribute at a higher level. ImplantBase serves as a field-facing front end for your ERP system. This integration enables self-service processes and automated support to accelerate throughput. And, the unification of multiple systems reduces the potential for costly errors. ImplantBase unifies and integrates operations tools to enhance productivity, visibility, and coordination at all levels. ImplantBase helps me everyday to move faster and get more done. With ImplantBase, I can easily get work done in 15 minutes that would normally take me at least an hour. Being able to streamline the flow of info within our company saves us all time and energy that we already couldn't afford to spare. The digital calendar helps us quickly visualize our business volume and helps us to prepare way faster than numerous painful emails. Specifically designed for orthopedic medical device companies, ImplantBase’s industry-leading, all-in-one cloud platform unifies your operations to enhance productivity, unlock capital, and encourage innovation. Free your reps to focus on building relationships by centralizing administration from any device, anywhere. Deliver more value with powerful real-time insights that bring clarity over inventory and case management. Automate unwieldy processes, improve communication, and increase productivity to maximize competitive advantage. Optimize capital and resources with full, up-to-the-minute control over your operations and last-mile supply chain. Make more informed decisions with access to real-time data, enhanced visibility, and powerful search capabilities. We provide resources to validate your version of ImplantBase and to maintain your validated state on an ongoing basis. Expedite the realization of ImplantBase’s benefits with a complete analysis of your existing business processes. This takes place within the first 30 days of every engagement. Map best-practice processes and workflows to your business. 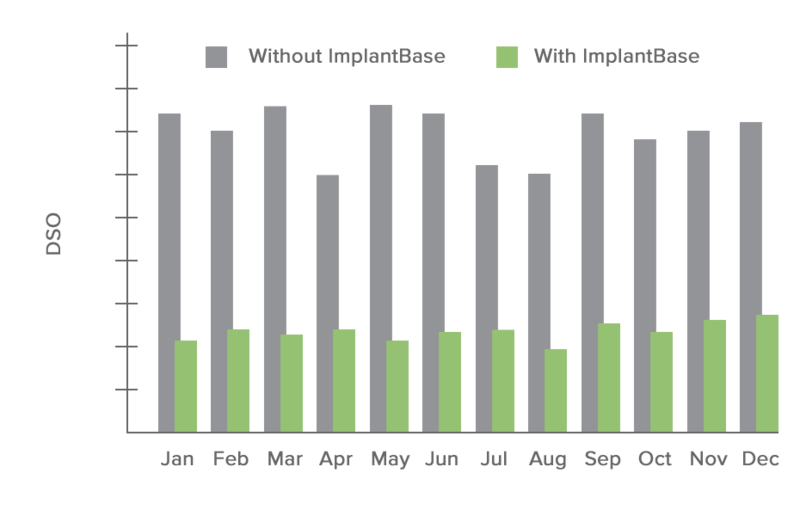 ImplantBase offers comprehensive out-of-the-box functionality as well as custom configuration possibilities. Unlock operational efficiency with rollout and field adoption, which takes place over 30-60 days depending on sales force size. Execute processes and tasks to accelerate your business without worrying about how the technology works. Transform how your team works to improve performance and drive innovation. Realize full operational efficiency as your field sales force adopts ImplantBase. Grow, scale, and succeed with relentless focus on your competitive edge. We’ve been where you are, which means we get it. From ImplantBase’s inception in 2009, we’ve made understanding—and transforming—the system our mission.